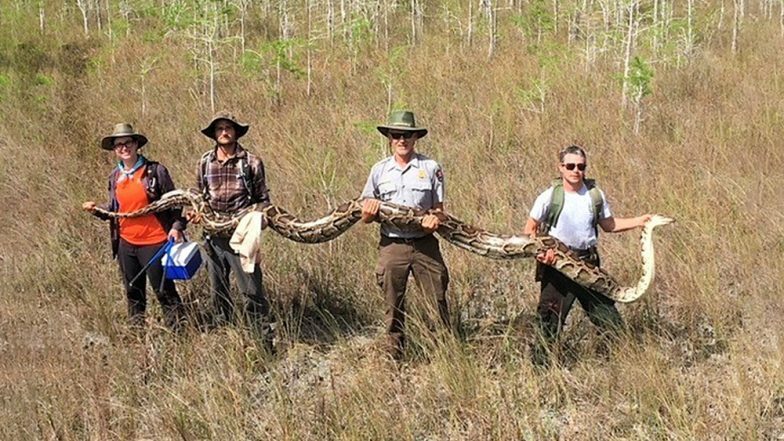 A record-breaking snake, a 17-foot long female python was caught in Florida Everglades. It was a pregnant female weighing about 63.5 kgs and had about 73 eggs! Researchers say this is the largest ever snake caught in the Florida swamps. The four researchers stood apart from one another with their arms outstretched to hold the huge reptile. Because of the 73 eggs that she was carrying, her body was as elongated as a one-storey building. A group called Big Cypress shared the picture on the Facebook page. Largest Burmese Python About 18-Foot Long Caught in Florida, View Pic of The 68 Kgs Serpent. The population of these Burmese pythons have been on a rise and environmentalists are working out ways to control them. A study has found that numbers of racoons, opossums and bobcats have fallen by between 88% and 99% as the python population has risen. Even species of foxes and rabbits have been endangered. The area of Everglades has more than 10,000 snakes. Researchers are already working to find breeding pythons. Australian Woman Finds 4-Metre-Long Python Next to Bed Apparently Wanting to Eat Her! Rescues Herself, Watch Shocking Video. The group mentioned that they are trying ways to control this invasive species. They are working closely with the US Geological Survey to remove other other breeding females from the same area. The male pythons are being tracked with radio transmitters in a bid to find the females nearby. They then capture the breeding females. These pythons pose a big risk to the other wildlife in the area.